On May 12th, Mark Z Danielewski’s new book, The Familiar, Volume 1: One Rainy Day in May, will be published by Pantheon. The book is the first installment of a novel in twenty-seven parts. To celebrate the launch of this gargantuan project by one of my favorite authors, I have put together a list of seven other book series that have many parts. 1) J. K. Rowling, Harry Potter. J.K. Rowling’s seven-volume book series about the wizard Harry Potter is the best-selling book series in the world with over 400 million copies sold. The first volume, Harry Potter and the Philosopher’s Stone, was published in the UK in 1997. In 1998, it was published in the US as Harry Potter and the Sorcerer’s Stone. The series concluded with its seventh volume, Harry Potter and the Deathly Hallows, in 2007. 2) Charlaine Harris, The Southern Vampire Mysteries. 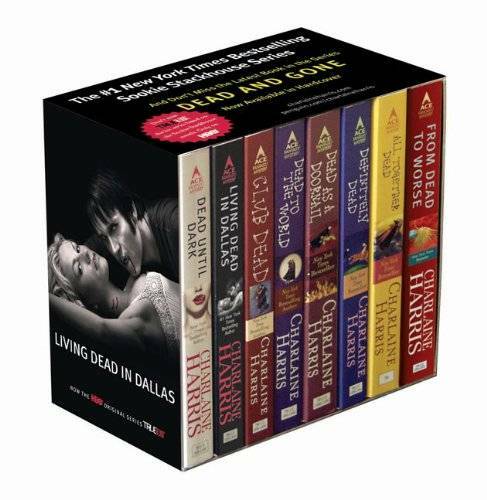 Charlaine Harris’ The Southern Vampire Mysteries, also known as The Sookie Stackhouse Series, are thirteen novels where Sookie Stackhouse solves mysteries involving vampires and other supernatural creatures. The first part of the series, Dead Until Dark, was published in 2001, and the last part of the series, Dead Ever After, hit the shelves in 2013. During the years that the series lasted, it spawned the highly successful HBO TV series, True Blood. 3) Robert Jordan, The Wheel of Time. Originally intended as a series of six novels, Robert Jordan’s fantasy adventure The Wheel of Time grew into fourteen novels. The Wheel of Time tells the tale of an epic quest to stop the Dark One from breaking out of imprisonment. The first part of the series, The Eye of the World, was published in 1990. The three final volumes of The Wheel of Time are written by Brandon Sanderson, based on notes and outlines left behind by Jordan, who passed away in 2007. 5) Octavia Butler, Patternist Series. Octavia Butler’s Patternist Series consists of five books published between 1976 and 1984. The first book in the series, Patternmaster, is in fact the end of the story’s internal chronology while the fourth part of the series, Wild Seed, is the beginning. Patternist Series tells the story of the two immortals Doro and Anyanwu, and explores themes such as racial tension, gender relations, biological engineering, and the eternal question of what it means to be human. The world of literature suffered a tragic loss recently with the passing of British fantasy author Terry Pratchett, the creator of the Discworld series. At the time of Pratchett’s death, the series consisted of 40 volumes. Since the publication of the series’ first part, The Colour of Magic, in 1983, the Discworld novels have sold over 80 million copies. Before the success of J.K. Rowling’s Harry Potter series, Pratchett was the best-selling author in the UK. 6) L. Frank Baum, Oz Books. When L. Frank Baum published the novel The Wonderful Wizard of Oz in the year 1900, he had no intention of writing a sequel. However, over a period of two decades, Baum went on to write a total of fourteen novels set in Oz. Baum referred to himself as Royal Historian of Oz, creating an illusion that Oz was a real place and that the books were based on true stories Dorothy and the other characters had related to him. Today, Baum’s novels constitute the core of over forty books collectively known as Oz Books. The last Oz novel by Baum, Glinda of Oz, was published in 1920, one year after his death. 7) Kresley Cole, Immortals after Dark. Kresley Cole’s paranormal romance series Immortals after Dark tells the story of a world where mythical creatures secretly live side by side with humans. The first part of the series was published in 2006. Since then, a total of fourteen installments have been published, the latest being Dark Skye, which came out in 2014. What other very long book series would you like to add to this list?